I usually write about my children on this page. Things they do that make me proud. Moments shared with them that inspire me. Experiences that fuel my admiration for them that I want to share with the world. Today I am writing about these things but in relation to someone else – my sister-in-law, Anne. 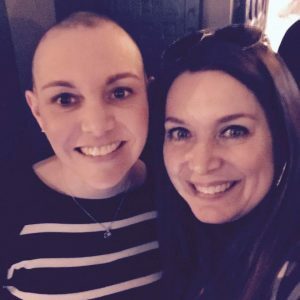 Last weekend she (along with my husband, my brother-in-law and a friend) shaved her head for a St. Baldrick’s Foundation event to raise funds for childhood cancer research. Several months ago Anne made up her mind that she would do this and never wavered in her decision. She worked for weeks to spread the word and raise money. Finally on March 25th, she sat next to her husband and celebrated their 12th wedding anniversary with capes and clippers together. Not only was Anne top fundraiser for her team, and the entire event, but she also chose to donate her long, naturally curly locks as well. The moment was emotional and amazing and tears welled up in my eyes. I was in awe of Anne’s dedication and caring, selfless spirit. With or without hair she is absolutely beautiful inside and out. I am lucky to call this woman my “sister”. So proud of you, Anne.